The PCE-EP 5000E floor scale cannot be verified so it is used in the industrial sector. 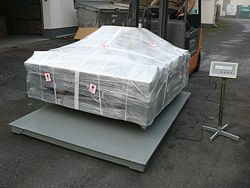 Thanks to both its solid design and its big weighing platform (1.5 m x 2.0 m) the PCE-EP 5000E floor scale is an ideal device for weighing big objects. The PCE-EP 5000E floor scale is made of lacquered steel. Weighing values can be easily read thanks to its external display (with 4 m length cable). 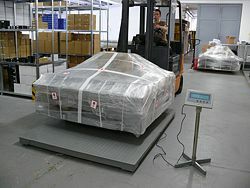 The display of the floor scale can be placed on a table or on a tripod included in the delivery. The integrated RS-232 port allows data to be transferred to a PC (the software kit with data cable can be ordered optionally). Thermal printer for the PCE-EP floor scale is also available. It is used to digitally process weighing details and print them. 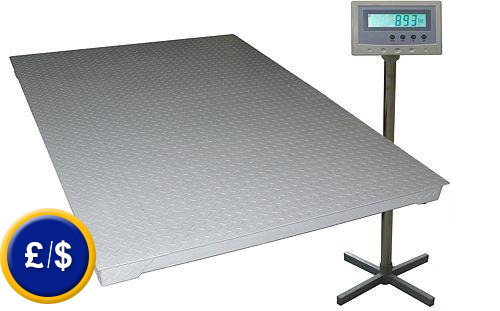 At this link you will find an overview of all the floor scales available at PCE Instruments. - The display can be placed everywhere. - IP 54 protection against water splash and dust. - The floor scale can be powered by a 230 V mains adapter or by an internal accumulator. Display High contrast 25 mm LCD display with 4 keys, backlight and 4 m length cable. It can be removed. Operating conditions 0 ... +40 ºC/10 ... 80% H.r. Environmental conditions -10 ... +50 ºC/5 ... 90% H.r. The PCE-EP E floor scale powered by a mains component in a warehouse. The PCE-EP E floor scale can be used outdoors due to its internal accumulator. 1 x PCE-EP 5000E Floor Scale, 1 x display, 1 x 230 V mains adapter, 1 x support and user manual. Software is in German and includes RS-232 cable. The software allows the transmission of data to a computer. Data can also be exported to other software such as MS Excel. For companies that wish to integrate the floor scale into their internal quality control system or for annual recalibrations. The ISO certificate includes a laboratory calibration and a document containing the measurement values. It also contains the name and details of the customer. To print results in situ. The printer includes RS-232 cable and 230 V mains adaptor. Paper width for the printer is 112 mm.